Page 1 of Moleskine 12. 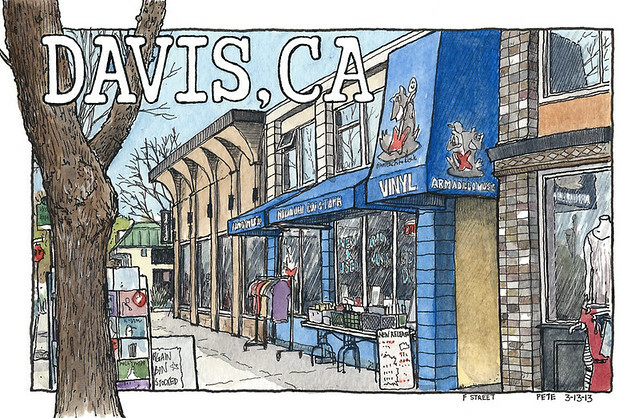 I wanted it to look impactful, and so I wrote ‘Davis CA on the page and the next day I went downtown at lunchtime to sketch a typical street, maybe 2nd St. It’s so sunny these days though and the shade was too great so I moved into F st and drew Armadillo Music. I drew the whole thing, except for some detailing on the tree, in my lunchtime, and added the colour at home. Armadillo is an independent record store in downtown Davis, I exhibited there a couple of years ago at the Art About, famous local singer Rita Hosking performed, lots of people came and it was a great experience. Always nice to have independent stores like this, but especially records stores. So, first page of a new sketchbook, let’s see where this particular illustrated journey takes us! Nice start to the sketchbook. How long does a sketch like this take you? When I head out for a lunchtime sketch, it usually averages about ten minutes or so – twenty if I’m pushing it or just find myself in a groove. Thanks! It took about 50 minutes for all the penwork. I didn’t eat anything on this lunchtime, more time for sketching. I added the colour later at home.